I had wanted to see Hugo ever since it came out in November, but things kept coming up, as they will during the holidays. Now the movie is at the end of its run, disappearing from theaters, but if you haven’t yet seen it, I urge you to look in the discount cinemas or catch it on DVD. Let me put it like this: I have been working on a year end, “Best of / worst of” blog post and having trouble coming up with “best” things in 2011. Hugo is one of them. This movie is a first on several counts for Martin Scorcsese: his first family film, his first fantasy, and his first venture into 3D. It is his love song to movies as a theater of dreams. 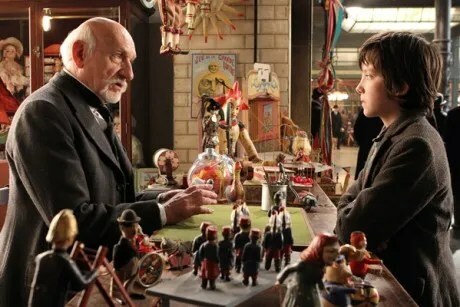 In 1931 Paris, Hugo lives with his father, a master clockmaker. The two are working to restore a broken automaton, a mechanical figure who writes with a pen. Hugo’s father also takes him to see movies, and speaks of his love for pioneer filmmaker, Georges Melies. When Hugo’s father dies in a fire, his drunken uncle takes him to live inside the walls of a railway station where he learns to maintain the clocks. The uncle disappears, but Hugo keeps the clocks running, steals food in the station to live, and does his best to restore the automaton, which he believes hides a message from his father. When a toymaker in the station catches Hugo trying to steal a mechanical mouse for its parts, he takes the notebook Hugo’s father left him, filled with drawings depicting the workings of the automaton. Hugo follows the toymaker home, begging for the notebook, and meets the man’s goddaughter, Isabelle. They become friends, and the mystery deepens when they discover that Isabelle has the heart-shaped key that can bring the automaton to life. When they turn it on, the mechanical figure draws a famous scene from one of Melies’ movies – the one Hugo’s father always talked about. By then, we have plenty of story questions, several engaging subplots, and adversaries in the form of the toymaker and a station guard with a doberman, determined to capture Hugo the thief. But the magic in this movie is far greater than the sum of these parts. Recently one of the bloggers I follow talked about one of his “all time favorite” books, and I started thinking of what makes a book or movie truly memorable. It’s more than simply the elements of craft – structure, plot, character, tension, and so on. These are necessary supports and can create a page turner, or a movie that has you gripping your seat without really touching your heart. When I read The DaVinci Code, for example, I couldn’t put it down, but now I have to google to remember the professor’s name. I don’t have to google to remember the name of the hobbit who carried the ring. What special elements make a book or movie unforgettable? It’s one of those things you can’t quite define but you know when you see it. Characters I want to hang out with are first on the list. Regardless of what they are doing, they become more close and real than many people I interact with in the daylight world. I didn’t read all the Harry Potter books to see what Voldemort was going do to next. I wanted to spend time with Harry, Ron, and Hermione. And Snape, Dumbledore, Luna, and all the rest. Imaginary friends in the best sense of the word. Compelling worlds are next on my list, worlds you want to visit even if dangers lurk in the shadows. Since reading the Narnia books, I’ve never been able to open a wardrobe without a secret thrill. An actual pilgrimage to 221B Baker Street caused only a slight adjustment to the 19th century inner London where I travel with Sherlock Holmes. And finally, it almost goes without saying that these are books and movies I can and want to enjoy more than once. If I bought them in paperback, my favorite books have scotch tape on their covers. I have several old VHS tapes I need to replace with DVD’s. Will Hugo find its place among my all time favorite movies? I can’t really say with the experience this fresh. The characters are compelling, their mysterious world shines with a golden light, and the movie is a celebration of the imagination in all of us – all in all, a pretty good bet to become a film I will remember, value, and probably enjoy again. This entry was posted in Movies, Stories and tagged imagination, movies, postaweek2011, stories. Bookmark the permalink. I was skeptical but you convinced me. HUGO is now in my Netflix queue. I think you’ll enjoy it. Now I need to get out and see the other intriguing year-end movies. I also loved this movie. I haven’t read the book yet, but my daughter and grandson both raved about it, and they both loved the movie as well. And I do think it’s worth finding it in a theatre. I seldom go to the movies, but this one deserves to be seen on the big screen. Maybe I’ll go see it again! My thought also was to get the book, not only for the pleasure, but to look at that translation from written to visual scenes – not unlike taking something apart as a kid to see how it’s put together, a pleasure the movie evoked. We drove up to Auburn to see it, and I’m hoping Hugo turns up at the Sunrise discount theaters.